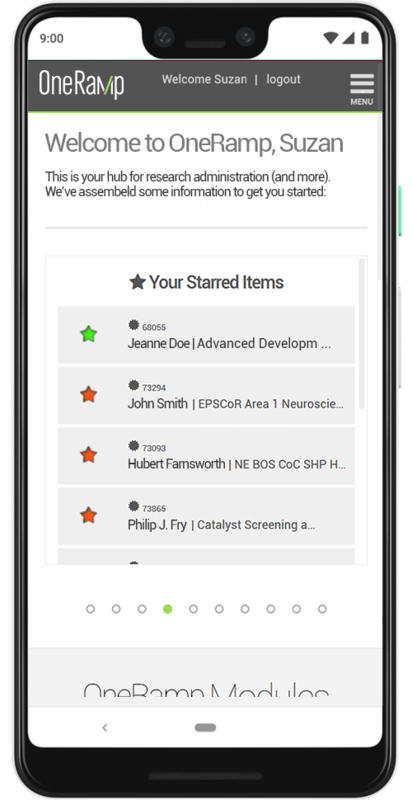 OneRamp is a single portal that gives you easy access to all your research administration functions and inspires confidence that you’re meeting federal, state, local and institutional requirements. Seeing a need to break away from the old, inefficient paper-based system, the University of Nebraska–Lincoln (UNL) identified the need for a research administration system. Initially, the greatest need was for pre-award process. Research showed other existing systems were too rigid and costly to implement. The university decided to build a homegrown system from scratch. Bolero's co-founder and CEO, Tim Savage, was hired as a UNL employee to lead the creation of its first web-based research administration system. A web developer, Tim dove deep into learning about the research administration process. Along with plenty of reading, meetings, observation and discussions with staff, coding began on NUgrant, now known as OneRamp. The first module, developed for the Office of Sponsored Programs’ pre-award team, goes live. The release received rave reviews from the staff and administrators. The university’s research administrators and staff envisioned more uses for NUgrant and started developing a long wish list. The success of the pre-award module brought more work requests to the team. As a result, the Conflict of Interest module is coded and released into production. What the team calls "EZforms" may not mean much to our customers because it's a back-end tool that our developers use. But after three years of building the system, it was evident that each research support unit had unique processes and needs. NUgrant’s previous success also bred demand for more work, so we needed to find a tool that enabled us to meet that demand in a way that still supported each unit’s process. "EZforms" provided that ability. The initial concept was successful, and to this day, we continue to refine the tools, now known as "EZforms2." The advent of "EZforms" was an important step to making OneRamp a product that provides value to any client. Its success planted the idea about the system’s commercial potential. Between 2007 and 2010, we added many new modules: Institutional Review Board, Institutional Animal Care and Use Committee, Internal Competitions, Institutional Biosafety Committee and an Event/List Management System. Adding new pieces to the system felt like reaching the crescendo – but we weren't done yet. After years of receiving interest from other institutions and discussing how we could sell/license our product, the OneRamp team decided to take steps to form a company and license the technology for commercialization from UNL. Co-founder Tim, a classical music fan, suggested we call the company Bolero after the 1928 piece written by Joseph Maurice Ravel. Ravel's "orchestrated crescendo" starts with a simple melody and rhythm played by a few instruments. Each line adds more and more layers until, at the end, the full force of the orchestra is heard at full volume. We agreed that was a fitting metaphor for the OneRamp story, and the name stuck. The Bolero logo also symbolizes this process. With that move to license university technology, Bolero became UNL’s first staff-led startup company. That’s why when we say, "Made for research administrators, by research administrators," we can back up that claim. Bolero's staff is relatively small but has a combined 41 years as employees in UNL's research administration office. We convinced the University of Nebraska Omaha that we had a good thing going. Thankfully, UNO agreed, and we began building their system, MavGrants. By 2017, Bolero had enough clients to become a full-fledged startup. We transitioned to full-time Bolero employees and UNL transitioned to being an important client. We built out our own space at Nebraska Innovation Campus, which has been an ideal place to run a business like Bolero. Being on Innovation Campus lets us keep close ties to the university while having industry and startup support. We've also launched our first out-of-state system for Tulane University and begun our biggest project yet, a single system for all the University of Nebraska campuses. "In meetings, our peers at other institutions talk about their systems. It sounds like the other systems make it harder than it needs to be. OneRamp is so easy and accessible. The dysfunctions other people talk about are easy to solve with this software." "We were switching all of our faculty to a new system. Changing the process or questions dramatically makes it so much harder to get buy-in. But if the changes are subtle, it makes it easier for the principal investigator to adapt. We didn't have to fit our program into someone else's mold; that is why we went with OneRamp." "A campus like ours doesn’t have a lot of admin support for funded activities. OneRamp has given staff members a quick and easy way to help faculty reach their research goals. I can't overstate it: From my point of view, it's been gratifying to see the impact it's had. There are lot of great things about OneRamp, but those little details make it a complete and fully inclusive way for everyone to know what needs to happen, in order to move forward with funded research." "It's the people. The Bolero team is what makes the whole process work. The hard work and dedication that they put behind and into OneRamp is what makes it successful. They can tweak the system to make it work for different types of proposals or even in other ways. The team’s willingness to make things the best they can be for you, the customer, is always important to me. Sometimes I don’t even think it's a product; it's the people that support the product who make it work." "The combination of solutions for interest reporting, grant administration, event coordination and so many other features helps avoid having multiple dissociative systems. Instead, the faculty – our customers – only need to become fluent in a single system.That builds trust in the system, and it creates efficiencies as well." 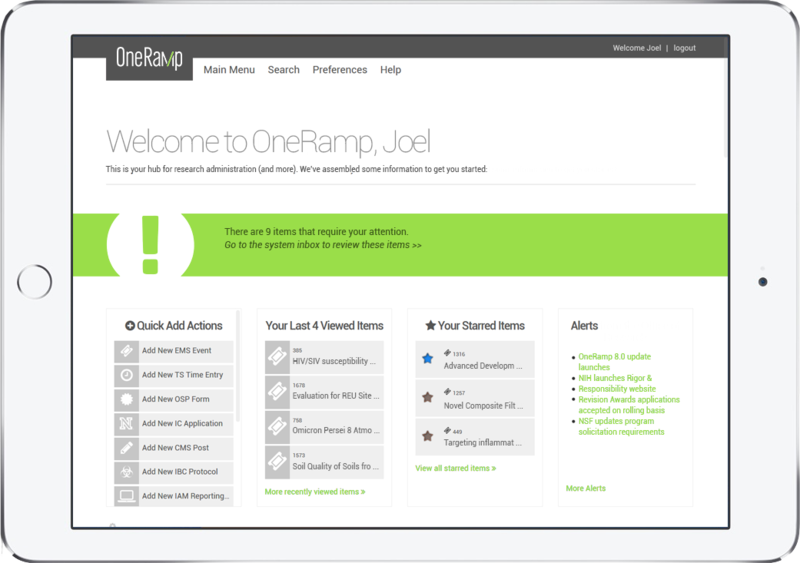 "OneRamp offers more individual customization and flexibility. It's easier to get much more specific user attention. The team really cares about meeting needs and satisfying their customers, so there's a good opportunity to build what you want so the system actually helps you, instead of offering a lot of stuff you don't need. It's amazing to see how the product has grown and been enhanced over time from the original point of conception. It's so flexible and easy to obtain information from the system and share links and info with other people. I can't imagine going back to paper or email apps." "Bolero got to know us and really understood our process and what our purpose was. A lot of companies think they're solving your problem but don't really know you. It's rare to have a developer who knows all the technical stuff and also understands the business process. Bolero did a lot of work on that. It gave us a lot of flexibility to design the system to match our needs. It's hard to even imagine how we operated before we had OneRamp." The OneRamp eRA Suite also features optional sections for sharing funding announcements, managing core facilities, communicating about research and managing events. And we can work with you to customize solutions or create all-new modules to meet your specific needs. The OneRamp eRA Suite is available 24/7 wherever there’s an Internet connection. Responsive means it's built to work on any device you can throw at it: Android, iOS, desktop PC or tablet. We also follow W3C and web accessibility standards to make OneRamp an application suitable for all users. Contact us to learn more about how we can help ramp up research at your institution today.